Keep Your Cat Cool in The Hot Days of Summer! Updated. Usually the hot days in the Southwest come in late summer. But sometimes a heat wave will surprise us, such as the upcoming week of 100+ temperatures! I try to believe that outdoor cats are “street wise” and find shady spots to nap out the day hours and know where to find some water to drink. Make “Catsicles”. Put some wet cat food or dry food mixed with water in a plastic cup in the freezer overnight. Pop out and put in your cat’s bowl for a special treat! Keep your cat out of your car if possible. For short trips, bring plenty of cold water for it to drink. Never leave your cat in the car unattended! 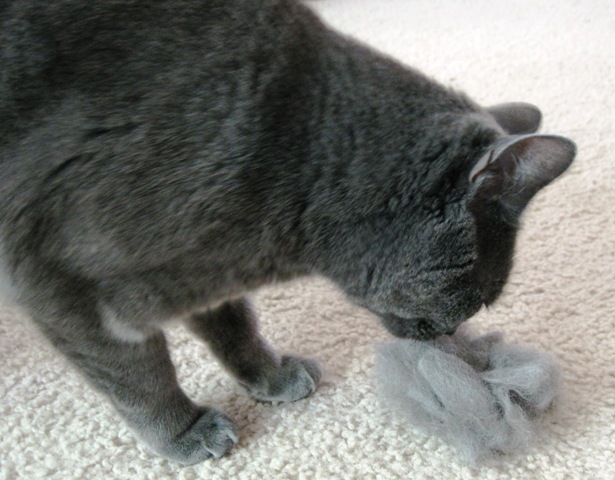 Brush daily to avoid matting and allow the air to flow through the fur. Refresh the water dish often to keep cool water for your cat. Keep a shady spot available for your kitty to nap in. How can you tell if your cat is nearing a heatstroke? Symptoms include agitation, extreme distress, stretching out and panting heavily, vomiting, glazed eyes and drooling. If you notice any of these signs get your cat to a veterinary clinic immediately. Untreated, he could collapse into a coma and die. If you can’t get to a clinic right away get your cat in a cool environment and keep him calm. Spray or pour water over him very carefully. Cover with wet towels and keep his head wet and cold to protect the brain but do not immerse your cat in water. Get to a vet as soon as possible. Thanks for reading these reminder tips from Georgia’s Gifts. 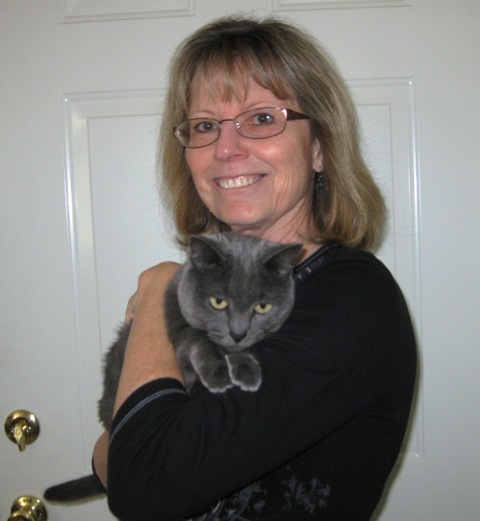 We know keeping your cat cool will insure that you’ll both enjoy a safe and happy summer! philately [fi-lat-e-li] noun 1. the collecting of stamps and other postal matter as a hobby or an investment. 2. the study of postage stamps, revenue stamps, stamped envelopes, postmarks, postal cards, covers, and similar material relating to postal or fiscal history. 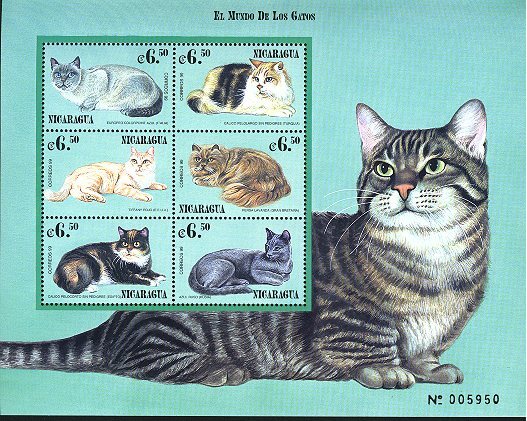 In the last few months I’ve become a sort of “feline design philatelist”. My new hobby is in the beginner stages, mainly just seeing cat stamps that I like and collecting them. Then of course I realized I needed a place to put them and had to learn about albums and pages sizes and page protectors…and so on. Right now I’m content with the basics, one page size and a protective cover. But as I’m learning more I know that will soon change. I have been amazed at the quantity of feline stamps! So many values, sizes and designs from so many countries. And as you see in the above description #2 for philately, there are also many more types of postal material besides stamps. 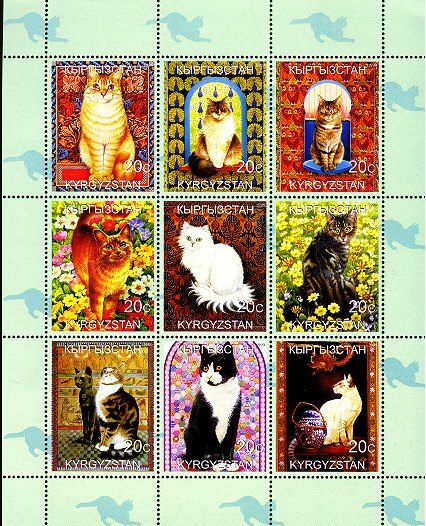 There are even cat stamp organizations such as Cats On Stamps. This could involve much more time & study than I ever imagined. For the mean time I think I’ll just enjoy my new interest. To me these stamps are mini works of art and I’ll display them in a pretty album for browsing. Below is one of my favorite finds so far. I love the colors and the backgrounds for each cat. Are you a cat stamp collector? I’d love to hear your comments and suggestions for my collection! All of a sudden I’m seeing little tufts of grey hair here & there on the carpet. Following them like a trail of crumbs from Hansel & Gretel they lead me to my Dessa’s favorite sleeping places. Now I know! It’s spring and the time for cats to shed their winter coat. 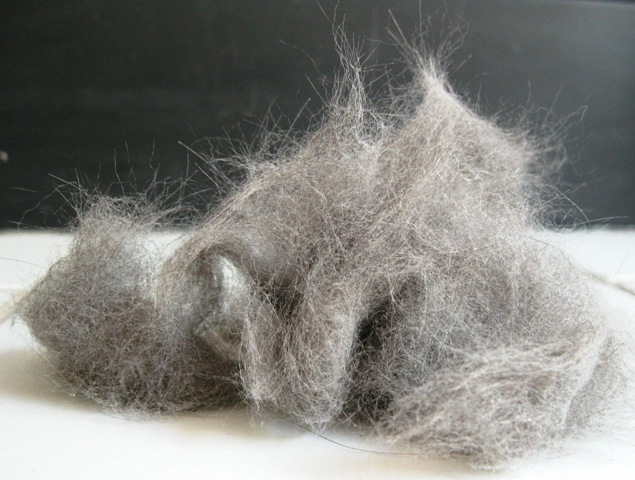 Shedding is normal and healthy for cats. It helps them get rid of dead and loose hair which can irritate their skin. 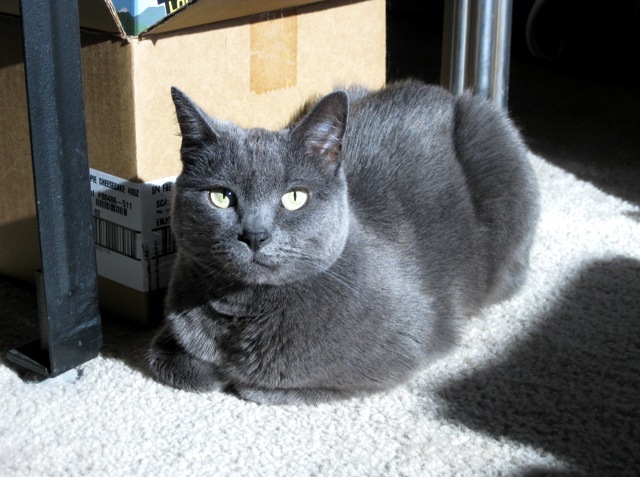 Being a Russian Blue our cat has a thick, dense double coat of fur. She has a lot of fur to shed! (This can also mean a lot of hairballs). We know it’s time to step up the brushing and grooming to help her out. Some cats love this attention and Dessa tolerates it fairly well when she is in a mellow mood. It’s also a good “bonding” time but when she has had enough she definitely lets us know! After a brushing her coat feels so soft and sleek when you stroke her. And I bet she feels refreshed. A thick pile of cat fur. A couple of days brushing. Some people make good use of this fur. They might spin it into a soft yarn for knitting or crocheting. Or transform it into handicrafts as seen in the book, Crafting with Cat Hair. We use the fur and hair from other animals for miscellaneous things so is this so different? It’s your call! There’s no items made of cat hair/fur at Georgia’s Gifts, but we have whimsical gifts & decor for cat lovers everywhere. We invite you to check us out! Our cats have very distinct ways of communicating with us. There are the variety of “meows” ranging from a soft sweet mew sound to an annoying “feed me now” MEOWWWW! And of course their eyes send us subtle messages. The slow closing and opening eyes which seems to show contentment; the wide-eyed stare when watching prey (even if it’s a feather on a long stick); or a loving look which melts your heart. The tail consists of a varying number of vertebrae (called “caudal” vertebrae), voluntary muscle, and ligaments and tendon to hold it all together. The tail attaches to the body at an area called “the tail head.” The first caudal vertebra attaches to a special backbone called “the sacrum” which connects the tail and lower back (“lumbar”) vertebrae. Injuries to the tail can cause serious nerve damage. The number of vertebrae is 19-28, and varies from cat to cat. (Our tailbone has only 4, in case you are interested). Now that that’s out-of-the-way we can talk about the fun stuff, the wonderful and delightful way a cat really tells us what is going on. I’m sure you have all witnessed most of these. The Erect Tail- My cat will meet me at the door with a straight up tail which I think means she is content and glad to see me. (Plus she knows a treat will soon be coming). A slight curve at the tip lets me know she is in a playful mood. The Curl– Sometimes, walking between my legs, my cat will let her tail curl gently around my leg or foot. I take this as a loving touch letting me know that she approves of me, at the moment anyway. The Wagging Tail– This lets you know your cat is not really sleeping but is content and partially alert. The Swish– A very focused cat, watching birds out the window or about to pounce on a toy. The Whip– “I’m annoyed” is the definite message. And if my cat almost beats her tail back & forth I know she has had enough! The Bristle– If your cat’s tail suddenly looks like a fat caterpillar you know it’s frightened or feels threatened. Do you have some more to add to this list? I bet your cat has some special moves all it own and I’d love for you to share them! You are currently browsing the archives for the Cat Facts category.